Most consumers have a vague sense that it might be environmentally unsound or even dangerous to throw batteries in the trash. However, not many people know which batteries require special handling, how to properly dispose of them, and most importantly where to properly dispose of batteries. As ever, we’re here to assist. First of all let me point out that, as in many things, California is a little different. California’s state laws are more stringent that the US federal environmental standards that prevail elsewhere in the country, which means Californians are required to dispose of all battery types at certified facilities. Visit CalRecycle’s website to find a nearby location for proper battery disposal. Alkaline Batteries: alkaline batteries are the most common type of batteries in battery powered household products, and are classified as non-hazardous waste by the federal government. 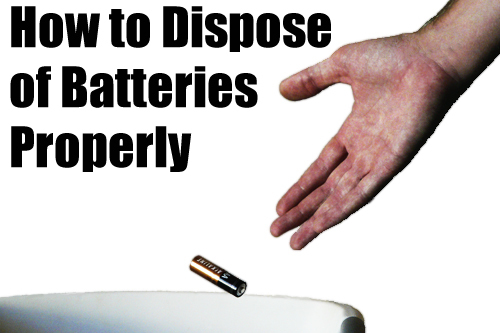 This means that you can safely dispose of alkaline batteries in your normal household trash. Button Cell Batteries: also commonly called watch batteries, button cell batteries have several different chemistries, all of which are label as hazardous and must be disposed of at a proper hazardous waste reclamation facility. Silver Oxide: silver oxide batteries are one type of button cell battery and are technically hazardous waste. However, federal law permits an exception for households because of the small amount of silver oxide battery waste they generate. Therefore, under current regulations, disposal of silver oxide batteries in normal household waste is permitted. Carbon Zinc Batteries: carbon zinc batteries are classified as non-hazardous waste by the federal government and be can safely disposed of in your normal household trash. Lead Acid Vehicle Batteries: any lead acid battery, like the one in your car, is considered hazardous waste and must be disposed of correctly. Most locations that sell vehicle batteries will also take them for recycling, though they may charge you a fee. On the other hand, businesses that recycle metals may be willing to pay you for your burned out car battery. Lithium Ion Batteries: lithium ion batteries are classified as non-hazardous and can be discarded as part of your normal household waste collection. However, these batteries can also be recycled. Rechargeable Nickel Cadmium (Ni-Cd): rechargeable nickel cadmium batteries are classified as hazardous. These batteries must be disposed of at a proper hazardous waste reclamation facility. Rechargeable Nickel Metal Hydride (Ni-Li or Ni-Hydride): rechargeable nickel metal hydride batteries are labeled non-hazardous by the federal government and may be discarded in standard household waste or recycled at a certified location. Avoid disposing of large quantities of batteries together. Some batteries will retain a residual charge and if enough of them come into contact in the trash they can heat up, potentially causing chemical leaks, explosions, or fires. While it seems like it should go without saying, never burn batteries. The volatile and potentially hazardous chemicals in batteries can build up enough pressure to explode if heated. To avoid chemical leaks never disassemble or crush a battery.